I made a startling discovery this morning. First off, a bit of back story. I did not end up going to the gym on Monday evening. I had a midterm, the kids were not being cooperative, and I was freaking out slightly (sorry guys!). I did walk around on campus for a while, but there was no significant exercise being done. I also didn't visit the gym over the weekend, mainly because of my belief that being tired and sore is not a good idea when you have to be on your feet for 4-5 hours. I did have a session with Avril the wonder-trainer yesterday, and boy can I feel it today! (Today might be a cardio-only day... I haven't decided yet). So yesterday, I was in the gym, and I was semi-hungry and semi-nauseous (she says it's normal that when your body starts building up lactic acid through muscle-toning exercise, you will feel a bit nauseated). It was hard work, and I was not wearing gym-appropriate clothing. I was wearing office-appropriate clothing. So resolution one: I need to buy something to wear to the gym that isn't embarrassing for me or for my fellow gym members ;) I was getting hot, and sore, and I was working really hard. And there were tears. This shamed me to no end. I cried while working out. Now, we're not talking full-out sobbing, wailing that it was too hard and I couldn't do it (like you might see on Heavy). This was more tears slipping out the corners of my eyes and I was powerless to stop them. I kept going, and I kept crying, and I was a bit disgusted with myself. She kept telling me how well I was doing, but I kept calling myself a failure in my mind because I was crying at the gym. I kept telling myself what a weak, pathetic idiot I was for thinking that I could do this. The fact that there were a few guys lifting pretty heavy weights and grunting away next to me probably didn't help... Big hulking guys lifting weights, fat girl crying while tossing a medicine ball. I was still pretty down about the whole thing when I talked to Rob later in the evening, and him trying to encourage me and cheer me up just brought me down further, because I was convinced he couldn't possibly understand and I was pathetic and he just wasn't seeing it. 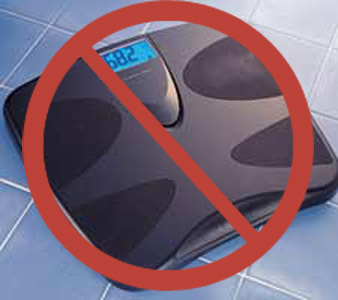 This morning, I stepped on the scale and nearly started sobbing right there (I'm actually tearing up as I type this). 282. I remember back in October, I promised myself I would never cross the 280 threshold again... I remember in November when I broke the 270 threshold (for a day) and how excited I was. How did this happen? How did I gain back 14 lbs? I have come to two startling realizations. I am also very sore today, but I'm not going to take painkillers because it's pain that I earned. I worked hard for it, and I'm going to enjoy it and let it remind me of how hard I worked yesterday and that this totally IS worth it. (for anyone who came around for knitting news today, I haven't got much... worked a bit on the one-row scarves, and I think I finally found a good joining method for the baby blanket and Rob's blanket, so I'm getting moving with those... Unfortunately, I have a couple of big projects due mid-April, one of which I wanted to have at least a draft of by the end of the month, so I'm doing a lot of school reading). If you do this, you do it for yourself. Not anyone else. If it helps, I also gain when I start back at the gym. It is frustrating, I agree. I don't know why my body reacts that way, but it does. I put the scale away too! Not taking it out for two weeks. Are you drinking lots of water? What are your meals like? I don't know if this helps you, but I have 6 meals a day. A protein and a carb. I try to have meat and vegetables only for dinner... no starches (bread, pasta, potatoes, rice). Don't give up girl! Just remember... keep your chin up, keep a positive attitude and get MAD at the gym! If I can't make it to the gym, I turn on the music and dance for 30 minutes. My kids think I'm nuts but hey... it works and I sweat! It's all about the clothes fitting better! The numbers only tell half truths, and most of that is a lie anyway.